When does a band become a collective? The basic idea is that is a collection of musicians who collaborate on a relatively informal basis, dipping in and out of musical projects and not being tied down by the strict regulations of a band. Bands of course being notoriously strict dictatorships and no fun at all, stupid bands! Whilst not of course the official home of the collective, Canada certainly has more than it’s fair share of them. The likes of Godspeed You! Black Emperor, Set Fire To Flames and Bran Van 3000 have all perfected the art of having loads of members on an almost entirely rotational basis, however none of have quite matched Broken Social Scene for sheer star quality. Originally the brain child of Kevin Drew and Brendan Canning, Broken Social Scene formed back in 1999 and have successfully managed to incorporate the best parts of their members other projects whilst still making music that’s cohesive and intriguing in its own right. Their line up has fluctuated from between six and eighteen members, and has included musicians from bands as diverse as Do Make Say Think, Stars, Metric and Feist. One of the most notoriously wonderful musical collectives popped up in Denver back in the early 1990’s: The Elephant 6 Recordings. The Elephant 6 formed out of a shared love of the Beach Boys and were particularly inspired by Brian Wilson’s, at that point unfinished, classic album Smile. Formed initially by members of Neutral Milk Hotel, Apples in Stereo and Olivia Tremor Control, the late 1990’s were something of a boom period for the collective with the likes of Beulah, of Montreal and all of the founding bands finding commercial and critical success. Of course collectives aren’t exactly the preserve of modern musicians; from the various configurations of Crosby, Stills, Nash and Young, through the revolving members of the Grateful Dead, and the superb funk-collectives Parliament and Funkadelic, collectives have made some wonderfully creative music and are a thoroughly thrilling way for musicians to expand their musical horizons – now let’s all form a collective immediately! Sauna Youth are Jen Calleja on samples and vocals, singing drummer Richard Phoenix, bassist Christopher Murray and guitarist Lindsay Corstorphine. The same four people also perform as Monotony, only doing different things, and on top of that various members are also involved in Tense Men, Primitive Parts, Feature and Cold Pumas. Which might possibly make them a super-group? Or it might not, we’re not really sure what the rules are. The artier side of punk rock or perhaps the punkier side of art rock. Sauna Youth are a blur of angular guitar riffing, pounding drums and shared vocal duties. They recall a lineage of art-school influenced post-punk that can be traced through The Velvet Underground, Gang Of Four, Life Without Buildings and they particularly remind us of mid-2000 noise making types Snow White and Ikara Colt. The band formed in Brighton, but like many were seduced by the bright-lights of London and relocated there back in 2011. Brighton is now home to Nick Cave, as well as younger pups like Royal Blood, Blood Red Shoes and The Wycthes, also The Kooks, but The Kooks are awful. Brighton was also home to the Eurovision Song Contest when ABBA took the crown back in 1974. 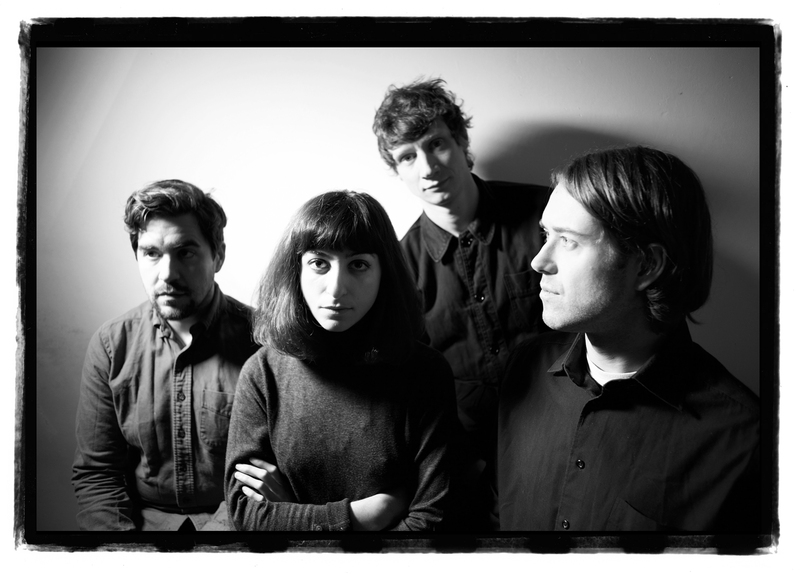 Sauna Youth formed in 2009, initially drawn to the idea of a DIY ethic; they self released and self recorded their music up until 2012, when they put out their debut album Dreamlands on the rather impressive split label of Gringo Records and Faux Discx. Now signed to London-based Upset The Rhythm they release their second album Distractions on June 8th. The sheer volume of stunning examples of great guitar riffing is as good a starting place as any. They’re all wonderful from the scuzzy aggressive buzzsaws that underpin the excellent New Fear, to the near instrumental chorus of Future Tense; a wonderfully repetitive guitar lick that gradually builds in pace and intensity, then slowly unfurls into a distance, spacey, psych-heavy outro that, showcasing their taste in unconventional song structures, lasts for around half the songs length. Some of their best moments are when they step a bit out of their comfort zone and push their artier and poppier sides into the foreground. Monotony is a fine example, harnessing the power of a guest vocal from everyone’s favourite amorphous guardian of the iPhone Siri, for non Apple users imagine Graeme Garden at his least emotive and you won’t be far off, they simply repeat the same chorus three times with a variety of bridges between them, the duelling male and female vocals singing in tandem, “waiting in the same and queue and it’s deja vu, monotony” and a series of other examples of the mundane and monotonous, it’s proof that if nothing else Monotony can be ridiculously catchy! Our two favourite moments on the album are probably two of the most contrasting. The superb (Taking A) Walk is superbly odd, a spoken female vocal, presumably from Jen Calleja, sits above a gently repeating bassline, with the mearest of guitar embellishments from company, it’s an odd tale of, “choking on eyes, eyes that can’t cope with how dangerously keen I am” and “counting the bones in my neck” before concluding, “you had a man at home what were you doing getting yourself in this state? Probably the same as me, the same as you, treading on the grass, spying for cats, mumbling songs, talking the dark out with a look”. Iit’s lightly reminiscent of Life Without Buildings, but also delightfully a sound all their own. The other stand out moment is probably their most accessible, and straight forward track Try To Leave; the guitar has something of the mid-noughties indie-scene, The Rakes in particular spring to mind-, lyrically it’s basically a series of excuses as to why they failed to leave a situation, “I tried to leave but I couldn’t think of where to go, I tried to leave but I think she knows I tried to leave.” They fluctuate from the plain lazy to the universally painful and there’s something wonderfully honest and simply brilliant about the song writing. Angular, arty, rough around the edges, it’s quite possible you’ll listen to this band and hear nothing but a load of people with relatively mundane issues, making a load of racket about not all that much. The wide eyed dreamers amongst us, and we’ll stick ourselves into that camp, will hear a band spotting the beauty and pain in the everyday, and hear our own lives in every riotous guitar riff, pounding drum beat and anxiously yelped vocal, all rather wonderful really! Distractions is out June 8th via Upset The Rhythm. Sauna Youth play The Old Baths in Hackney Wick June 5th.